Pieride du sainfoin, Беляночка дюпоншеля. The species is distributed in South Europe, Asia Minor, Balkans, Caucasus, Transcaucasia, and Iran. Armenia is inhabited by L. d. lorkovici (Pfeiffer, 1932), which inhabits calcareous grasslands dominated by Onobrychis cornuta – the host plant of Eastern Wood White in Armenia. Thus the species occupies an elevation range between 1000 and 2200 m a.s.l. 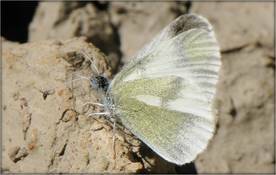 Eastern Wood White gives two generations per annum, the first generation’s butterflies have darker underside and are on wing from late April; the butterflies of second generation have paler underside and are on wing until mid August. The species can be considered as uncommon within most of the sites with typical habitat, though in some sites its number is low. It demonstrates stable population trend through the period of 2003-2013 (p>0.05), which is most probably determined by strong resistance of the host plant – the thorny bush towards overgrazing. Despite on that some local threats exist and can potentially harm the species if expanded. Those are related to improper behavior of local shepherds and kids from the surrounding villages, which are often make fire of alive Onobrychis cornuta, for local cooking or just for fun. The species is not been included in IUCN and National Red Lists, as well as in CITES and Bern Conventions, but is listed in European Red Book as a Least Concern. Taking the current population trend and high level of host plant's resistance towards overgrazing, at current it can be evaluated as Least Concern. Nevertheless, it requires some attention in Armenia, therefore a reservation should be made about necessity of a nation wide education and public awareness program, aimed at delivery of responsible behavior norms in the field, and therefore - at prevention of decline of Onobrychis cornuta - a very important host plant not only for the Eastern Wood White, but also for number of other butterfly, moth, beetle, and other taxa.